WINNIPEG - A new online program to protect children in Manitoba was announced by Winnipeg Police and the Canadian Centre for Child Protection. The online program provides sexual abuse awareness training for people completing criminal record checks. Funding for the program is being provided by the Winnipeg Foundation. In less than two hours, the course will teach people about child sexual abuse, the grooming process, professional boundaries, child disclosure and reporting. Those who take this training after getting a Winnipeg Police Criminal Record Check receive the training FREE until March 31, 2019. “The more training that agencies can provide so that children are kept safe will go a long way in creating a healthier environment for our kids. 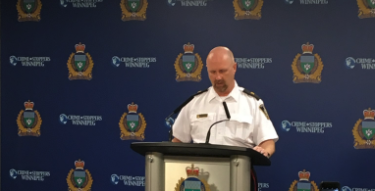 The Winnipeg Police Service is proud to be involved with our partners to make that happen,” said Police Inspector Kelly Dennison in a release. More than 11,000 people have completed it the course since it's launched last summer in Canada.